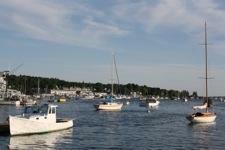 We anchored at Lewis Cove in Linekin Bay. A short dinghy paddle brought us to a lovely park at the end of the cove. We beached the dinghy (thank goodness because the tide was still coming in, just haven’t figured out those ME tides yet!) and took a stroll through the park to access the main road. 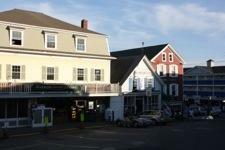 About half a mile later, we walked across the peninsula and into Boothbay Harbor. 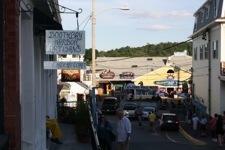 Boothbay was bustling with tourists but still felt a bit quiet for a Saturday night. We browsed the shops and restaurants and decided we had enough of this tourist hub and were ready to go back to Rode Trip for supper. Of course, we needed a bit of gelato to hold us over for the walk and paddle back. Once home, Brian baked a delicious loaf of sourdough bread which we spread with pesto, tomatoes, and clams and paired with red wine. Another quiet night at anchor – we’ll see what tomorrow brings. I am really enjoying your posts …you both write so well. I feel as if I am on vacation too! If you get a chance to go all the way upon a lighthouse it is amazing….I went on a Cheryl TOBEY trip to one near Boston Harbor…took pictures, met the Coast Guard dog, etc. It sounds as if you have not experienced the thunder and lightening storms that have afflicted the Boston area…I am glad for that….